The term “post photography” has been rattling around since the early days of the “blogosphere.” It emerged in the early to mid 2000s, a recharged attention to photography’s alchemical possibilities (and limitations), high on digital and other forms of manipulation, which became the fuel for many conceptually leaning photographers. Think Lucas Blalock, Kate Steciw, early Talia Chetrit, and pretty much everyone in Charlotte Cotton’s comprehensive 2015 anthology Photography Is Magic. Jon Feinstein: This is super exciting to me -- I've been following all of these artists for a few years, to a decade-plus w/ Kate Steciw’s work, but this is the first time I've seen them showing together. Melanie Flood: It’s exciting for me too! This is my second time showing Teresa Christiansen’s work and have been following Sarah Meadows’ practice for a number of years. I was introduced to Anne Hall through the collaborative works she makes with Kate Steciw– whose photographs I’ve also been loving on for a decade. Every exhibition starts visually for me and collectively their work makes sense. I need to enjoy what I am looking at and want to offer that experience to gallery visitors. 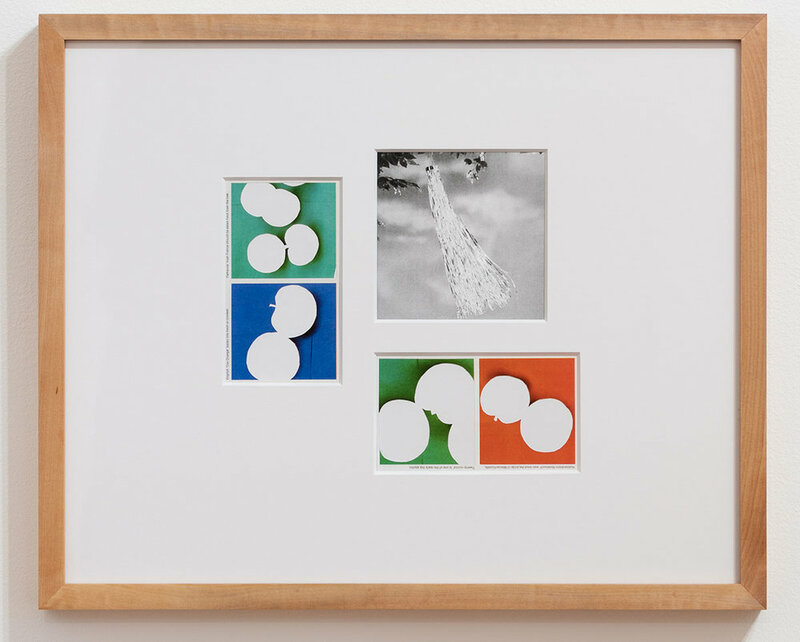 Beyond aesthetics each are invested in photography’s history and future while being playful in their respective practices but serious in their research. Feinstein: How did the exhibition come about? Flood: I thought a group exhibition would be the best way to extend the conversation Teresa and I began during her solo show Indifferent Horizons in 2016. I never organize anything starting from a theme as what inspires me to work on a project is the artist's practice. I had been visiting with Sarah and her piles of tiny cuttings from magazines, seed catalogs and lots of notebooks filled with her research on 19th century gardening. Teresa's studio was strewn with hole punched prints of flowers and weeds. There was a conceptual thread between their practices dealing with how nature is depicted photographically. Kate and Anne were on my mind and felt like the way to round out the exhibition. Feinstein: When you first reached out to me, you highlighted the artists' use of photography to question how we experience nature. How do you see their work addressing these issues and why are these artists critical to that discussion? Flood: We live in an advanced technological era where many of our interactions are mediated and manipulated, if not by our own hand interrupting a hike for Instagram or by the way deceptively grown, perfectly round blueberries are photoshopped for a highway billboard. 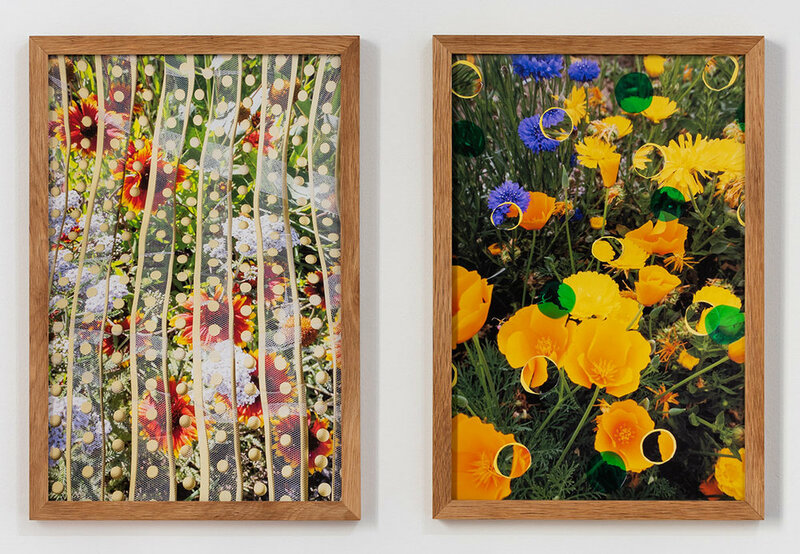 Each artist responds to issues embedded in photographs of and about nature, while coping with larger issues of humanity’s attempts to control nature and living while digitally distracted. Feinstein: How are these artists breaking that down? Flood: We are familiar with picturesque western landscapes, so sharp and open. I want to see something wild and luscious, something weird even. Sarah embraces blurry low-res photographs of her computer while it plays a video from YouTube. Teresa uses her iPhone and makes quick prints then cuts, and rearranges a new landscape by hand to re-photograph. 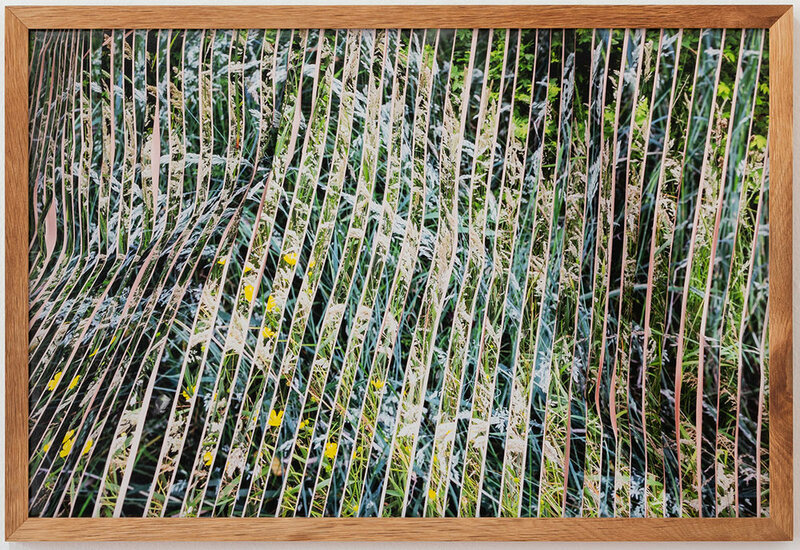 Anne gathers plants to record their imprint using the sun, but takes the the photographic process apart to the point of painterly abstraction through a resist and saturated dyes. Kate’s practice is not invested in nature as a subject, she’s known for using stock imagery to think about digital image dissemination. 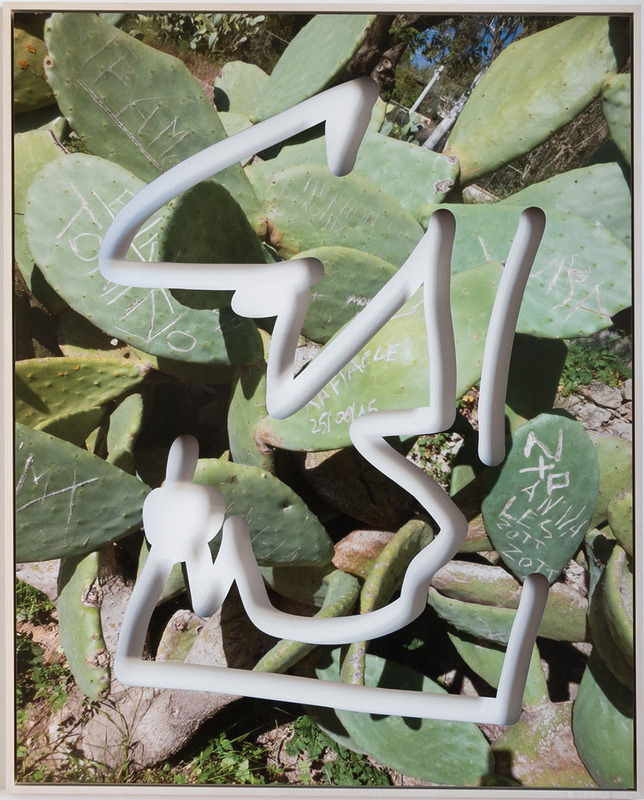 She recently made a body of work using her own snapshots and one was of a resilient cactus that had been scored and signed by visitors. The image is then machine cut to reveal the wall it’s hung on. Formally and conceptually it felt relevant to include in the show. All of the works dismantle tired ideas to create new challenging forms. Feinstein: Why the decision to focus on female artists? Flood: I naturally gravitate toward and surround myself with female artists so it’s not a political decision. While being female inherently changes one's point of view I think the works exhibited have more to do with where photography finds itself and where we find ourselves in nature. However, this show offers a counterpoint to white male photo histories and the ongoing colonialist tendencies when it comes to photographing the land. But that wasn’t the goal. Feinstein: Each artist is heavily engaged with "post photography," using various devices to push beyond the straight photograph. Why is that important to this exhibition? Flood: Portland does not have a constant flow of contemporary photography so it’s important for me to support artists who are aware of the “post photographic” and open up a scene that’s heavily steeped in straight documentary and historical photo processes. I see these artists in a sweet spot because they studied photography exclusively at a time when analog and digital technologies were overlapping. So, they know the history, the analog modes of making and the digital tools of manipulation while taking advantage of the spirit of interdisciplinary art which is celebrated today. Darkrooms are becoming obsolete with their visceral attributes that made learning photography so invigorating...and toxic. Each artist is putting their hand back into the photograph whether making hidden digital gestures visible, or by using physical tools. The artists are making images through layers of physical and intellectual processes, instead of merely capturing what is before them. Feinstein: What do you hope people seeing the show will take away from it? Flood: I want people to come to a show and dislike things, question why a photo is stretched like a painting, or be confused to how the image was made. Last weekend we had a panel with Sarah and Teresa moderated by photographer Joel W. Fisher and someone in the audience said that the photos were debased! I think those types of reactions are exciting. I love intergenerational conversations the most because there is so much to learn and disagree on. The photo purists and the photo weirdos in a room together, omgeeeee. Feinstein: What’s the story behind the exhibition title? Flood: ‘If but a sunbeam strikes too warm’ is a line from a fable written in verse ‘Enchanted Plants’ by Madame Maria Henrietta Montolieu. As part of Sarah’s research she came upon this special text. Published originally in 1800 and written for Montolieu’s children it was included in this 1858 anthology The Language and Poetry of Flowers. The title sounds delicate in its poetic verse, but the vision of what occurs when a sunbeam strikes too warm conjures a destructive image. The tension between those two realities felt representative of the works in the exhibition. Feinstein: Nearly (if not all) all of your exhibitions are solo or two-person shows - group shows are rare for you. Why now/ why this show? Flood: You’re right. All of the shows I’ve organized at the gallery have been solo exhibitions, unless I invite an artist to curate. Part of the appeal of the solo show is offering an artist a space and a deadline. A solo gives an artist the opportunity to really spread out physically while honing in on an idea. It’s rewarding to watch an artist grow, bring their work out of the studio and into the gallery. This past summer I participated in my first art fair in Seattle. I showed Evan La Londe, Clifford Prince King, Rose Dickson, Sarah Smiley, Matilda Alair, and Teresa Christiansen all in one booth. The experience of having all their work together was really challenging and rewarding. I wanted to try it in a more focused way, give time and space to artists working with the same ideas. Feinstein: Where are you personally in this? Flood: My Mother - a lifelong New Yorker came out to visit a few years back and I drove us out to Opal Creek. It’s this wondrous lush supersaturated old growth forest full of streams and pools of crisp glistening water. As we were walking down the path she picked up a very long stick. I asked her what it was for and she said “ In case someone tries to get us”. I laughed, but after we ate our sandwiches by the water she was ready to go. It took 2.5 hours to get to a place to just stay for 30 minutes. I have a similar relationship to nature. Feinstein: I love asking this question to individual artists, but think it's appropriate with you as a curator – a visual DJ of sorts. If you were to make a soundtrack or mixtape to complement this show, what would it open with? What would be the closing track? Flood: I’d say opening song would be Talking Heads’ “(Nothing but) Flowers” and the closing track would be “Big Sky” by Kate Bush.